While there are many federal worker protection laws, individual states have a lot of leeway as far as setting workers’ compensation rules and as far as enforcing worker safety regulations. Recently, one study compared workplace injury and fatality rates across different states to see how each was doing with protecting workers. The study was conducted by the RAND Corporation and it used data from the Bureau of Labor Statistics to estimate the rate of workplace injuries and workplace fatalities in different states in the country. Our San Antonio work injury attorneys know that most people would assume a high rate of workplace injuries and a high rate of workplace deaths would go hand-in-hand. In fact, the opposite turned out to be true. In states where there were a lot of reports of non-fatal work injuries, there were fewer workplace fatalities and vice versa. At first, the study data seemed counter-intuitive. After all, if workplaces are unsafe enough to cause high rates of workplace deaths, it seems like it should be obvious that these same worksites would also cause lots of injuries. After considering the data, however, researchers came to the conclusion that the results of the study could be easily explained. The explanation is a basic one: states with better workers’ compensation laws and with more protections for workers tend to have more reported non-fatal injuries but safer workplaces. When a state has a business and regulatory climate that is protective of workers, workers are more likely to feel comfortable reporting injuries and are more likely to make reports of injuries in order to take advantage of generous workers’ compensation benefits. Thus, these states will have a higher rate of reported non-fatal workplace injuries. Since non-fatal injuries are reported with greater frequency, worksite safety can be improved and worksites may be inspected more regularly to ensure that employers are taking steps to make the work areas safer. Better worker protections and increased injury reports will, therefore, result in worksites where fewer fatal injuries occur. When a state doesn’t have very strong worker protection laws or is not generous in workers’ comp benefits, on the other hand, fewer workplace injuries are likely to be reported. As a result, these states will have a lower rate of nonfatal workplace injuries. Since there are fewer unions, less protections for workers and fewer chances to fix safety violations, it also stands to reason that the death toll in these states will be higher. This conclusion is supported by the fact that most of the states with high fatality and low injury rates are southern states that tend to have less favorable workers’ compensation and worker protection laws. Texas is an example of one such southern state. According to Think Progress, Texas has the highest rate of workplace fatalities out of every state in the United States. This is bad news for the Lone Star State, and the recent tragic accident in West Texas demonstrated that the high number of workplace deaths may have something to do with a lax regulatory environment and employers not taking workplace safety seriously. Obviously, the outcome of this study shows that there may be a need to make some fundamental changes in order to better protect workers from death on the job. Public education campaigns and laws targeting the use of cell phones while driving generally focus on the dangers of handheld phones. As a result, many people believe that it is relatively safe to use your phone while you are driving as long as you do it using Bluetooth or another hands-free system. Recent research, however, tells a different story. Our San Antonio car accident lawyers know that drivers using their phones are always going to pay less attention to what is going on around them and thus will be at a greater risk of becoming involved in a crash. A recent Texas A&M Study confirms this fact, suggesting that it is no safer to use a voice-to-text application to send a text while driving than it is to send a text manually. CBS News reports that researchers from Texas A&M asked 43 drivers to operate vehicles on a closed course. The drivers first drove the course without using a cell phone at all. The drivers then drove the course three more times, each time doing a different texting exercise. One of the trips involved using the Siri personal assistant on the Apple iPhone to send a text message. A second involved using Vlingo, which is an app allowing hands-free texting on Android phones. Finally, on the last trip, the drivers sent a text message manually. As the drivers drove the course, researchers measured how long it took the drivers to complete a task and how long it took the drivers to respond to a traffic light that was turned on at random intervals along the course. The outcome showed that the response time of all drivers was significantly delayed any time they were texting, whether they were doing so manually or whether they were doing so while using their hands-free apps. Researchers also noted that drivers who were texting took their eyes off the road more often and took twice as long to respond when they were texting as compared to when they were paying attention. This was true whether they had the phone in their hands or whether they were using their voices to text. Further, while the drivers performances were the same with both manual texting and voice texting, it took less time to send the text manually than it did to send the text using voice software. This could mean that drivers who use Siri and other voice programs to send a text message are actually at greater risk of becoming involved in an accident since they will be distracted longer than other drivers. Also concerning is the fact that study participants reported that they felt safer when talking to their smart phones as compared to when they were sending a text message by holding their phones. This deceptive and false sense of security could lead more drivers to text and drive and could thus create a greater danger for the drivers, passengers and others sharing the road. On May 10th of this year, a tragedy happened in Texas. A five-month-old baby girl was left inside of a car parked outside of a Texas high school where her mother was a teacher. The baby died and investigators are still looking into the case. Unfortunately, it was not an isolated incident; Texas records more of these deaths than any state in the nation. Our San Antonio personal injury attorneys know that this baby’s death was not the first to occur as a result of heatstroke and it won’t be the last. Texas summers are very hot and the National Highway Traffic Safety Administration (NHTSA) reports that 75 percent of the 32 heatstroke deaths in the U.S. last year occurred in June, July and August. Heatstroke deaths can happen fast and parents and caregivers need to be aware of the very serious dangers that young children face. According to NBC News, 567 kids have died in hot cars in the United States since 1998. This year alone, there have already been eight children killed by heatstroke including the five-month-old baby in Texas. Most of the children who died this year were babies or children under two, which is consistent with past findings showing that children ages four and under are at the greatest risk of heatstroke related fatalities. Children are not as well-equipped as adults to regulate their body temperature and so are at a greater risk of dying of heatstroke with even a short period of exposure to excessively hot temperatures. Babies and young children are also unable to get themselves out of cars if a parent or caregiver forgets that they are in the backseat. Rear-facing car seats also up the chances of a baby being left inside of a car since a parent may not notice that the child is still in his or her carrier. Unfortunately, a caregiver doesn’t have to have a long mental lapse in order for a baby or young child to die. NHTSA indicates that the temperature inside of a car can reach deadly levels within just ten minutes on an 80 degree day, even when the window has been cracked open. A parent or caregiver who forgets the child even for just a few minutes could thus cause serious and permanent injury or death. When children do survive being locked in a hot car, they are likely to experience life-changing and permanent damage including cognitive impairments, blindness, deafness, and brain damage. Parents and caregivers need to do everything possible to prevent further tragedies from occurring in Texas this year. NHTSA cautions that even dedicated and conscientious caregivers could forget a child in the back seat, especially if dropping off the baby is not part of their normal routine. Bus drivers and daycare centers may also forget children in vehicles, especially if they are transporting multiple kids and don’t check all of the seats at the end of their route. The NHTSA’s summer campaign, Look Before You Lock, is intended to remind parents to check for their babies before they lock their car doors. Hopefully this campaign will prevent more deaths from happening this year either because of parents forgetting their kids or because of caregivers who fail to live up to their obligations to keep children safe. If your child has been injured, contact the Herrera Law Firm at 800-455-1054 for a free case evaluation. According to Time Business & Money, peak traffic ticket season is here and law enforcement is cracking down on violators who do not buckle their seat belts while in the car. The two weeks surrounding Memorial Day are always a prime time for tickets to be issued as police step up enforcement of seat belt laws as part of the NHTSA’s National Seat Belt Enforcement Mobilization Campaign. It likely signals what we know will be a long summer of traffic enforcement efforts. Our San Antonio accident lawyers know that wearing a seat belt can help to prevent catastrophic injury or death in the event that an auto accident does happen. Since police are cracking down on seat belt violators, drivers and passengers now have even more reasons to buckle up: to avoid a ticket and to save a life. However, whether an accident victim was wearing a seat belt at time of collision has no bearing on whether a suit for damages should be pursued against the at-fault driver. According to Time Business, law enforcement will be focusing on enforcing seat belt laws at multiple times during the day and evening. However, drivers and passengers in cars at night tend to buckle up less often than during the day, so it is likely that more citations will be issued in the evening. Further, men between the ages of 18 and 34 are also the least likely to wear seat belts reliably every time they are in the car, so there may be more citations issued to people within this age group. The idea behind the added enforcement and behind the National Seat Belt Enforcement Mobilization Campaign is to encourage drivers to get into the habit of buckling up. While some argue that the extra enforcement creates a police state or is simply an effort to generate revenue, the fact is that the focus of seat belt enforcement is safety. This is why there is also a public education program called Click It or Ticket, which goes along with the stepped-up citations. Hopefully, when people either get a ticket or see that there is an increased chance of being cited, they will make an extra effort to be conscious about buckling their seat belts even for short trips or even when they are passengers in cars. Once drivers and passengers get more used to buckling their seat belts whenever they are in the car, they will ideally continue to do so even after the extra enforcement period has ended. 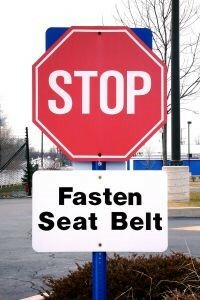 Making the choice to buckle up every time is a smart decision for everyone. Of course, it is also important to be aware that your decision to wear a seat belt or not wear a seat belt should not have an impact on your ability to recover compensation if you are involved in a car accident that was caused by someone else. In fact, in a case called Nabors Wells Services LTD. v. Romero, Texas recently reaffirmed the long-standing rule that someone who caused a car accident could not reduce his liability by using the “seat-belt defense” against the injured victim.